None of us have ever witnessed worse scenario of a government being powerless against the monopolists who pursue nobody’s but their own interest and the government, who is responsible to pursue people’s interest is literally powerless even after all the power given to them by us. In Pakistan, associations are the worse monopolies. 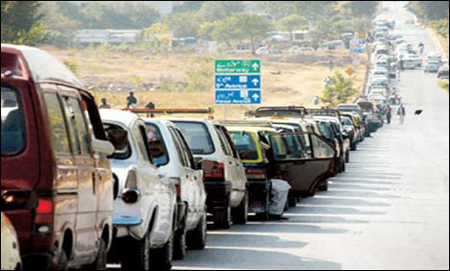 The mile long queues of cars to fill up their CNG from few of the stations who denied the All Pakistan CNG Association (APCNGA) call to shut down their pumps, have now been shut down for 48 hours starting from 9 am Wednesday to 9 am on Friday to observe CNG load-shedding holidays. But since Sunday, 25th of November, CNG station owners had shut down their pumps saying that they were incurring significant losses at the current price scenario. Earlier, the audit firm in charge of evaluating the pricing mechanism of CNG prices had said that the that compression and operational expenses validate the previous prices. However, motorists who were protesting at M.A. Jinnah road were furious at the owners saying that there are more then 3000 CNG stations across the country which in itself is an indicator of the profit margins associated with this business. Further adding that the unprecedented liberty given to CNG station owners is the chief cause of the crisis and should be tackled with an iron hand. 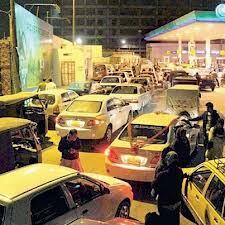 The CNG association said that the station owners were ready to give up their licenses if their demands are not met. While, officials of OGRA and CNG association were to meet today in a public hearing to find a conclusion to the worsening situation which has been the cause of the disappearance of public transport from the roads as most of it now runs on CNG although it sets fares on the prices of Diesel. Associations are the worse kind of monopoly in Pakistan and new laws have to be made to govern them as too much power lies in their hands, the power to suspend service is the worse.